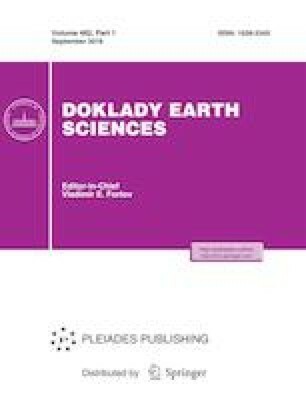 The isotope–geochemical composition of the Early Devonian magmatic rocks of the Chanchar potassium basaltoid volcano–plutonic Complex in the Sakmar Zone (Southern Urals) has been studied for the first time. The character of the noncoherent element distribution and their ratios suggest that the melts parental to the rocks of extrusive, subvolcanic and intrusive facies were formed from a single source of the primary magma. The low concentrations of HFSE relative to the MORB composition, relatively low εSr, and high εNd suggest the formation of primary melts from the moderately depleted mantle source. The enrichment of rocks with LILE indicates a fluid mantle addition introduced to the melts during evolution of the primary magma. Original Russian Text © P.I. Fedorov, V.G. Korinevsky, B.P. Zolotarev, 2018, published in Doklady Akademii Nauk, 2018, Vol. 482, No. 1.